gallons of wastewater flow per day, was constructed in the early 1970’s to provide sanitary sewer service to the residents of Macomb County. 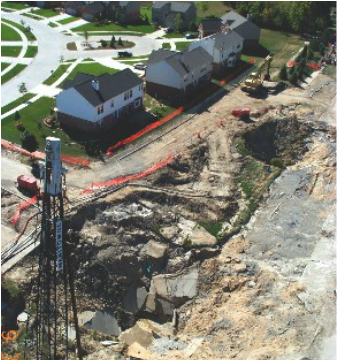 In August 2004, six homes were evacuated as a safety precaution when a 40-foot deep sinkhole developed over the Romeo Arm Interceptor in the city of Sterling Heights, Michigan. NTH was called to the site to stabilize the area, make preparations to ensure no interruptions to wastewater service, and to permanently repair the damaged interceptor. working closely with the project team and with the owner, Detroit Water and Sewerage Department, to accomplish the repairs.